The large size of the walrus makes them very interesting. They have a body that is well designed to allow them to survive both in the water and on land. The weight of them varies a great deal based on gender and location. The males weigh considerably more than females. The Pacific Walrus weighs from 10% to 20% more than the Atlantic Walrus. A full grown male Pacific Ocean Walrus can weigh between 1,800 and 3,700 pounds. They are classified as the second largest of all pinnipeds. Only the Elephant Seals are larger in size. The tusks are a big part of the body of the walrus. In fact, size of the body and the length of the tusks help to determine the hierarchy among them. The Atlantic Walrus tends to have tusks are shorter than those of the Pacific Walrus. The tusks are very important to the overall status in the hierarchy of the walrus. They live in very large groups on land, and those with the largest bodies and longest tusks are dominant. They get to pick the best locations on land for resting. Both the males and the females have tusks, and they can grow to be over 3 feet. They can also weigh as much as 12 pounds. The males do have tusks that are longer and wider than the females. The males often us these tusks for fighting with other males during mating season. Only the largest and strongest males will get to take part in mating, and will do so with several females. These tusks also serve as a tool when the walrus needs to dig holes in the ice. They also use them to help with climbing out of the water onto pieces of ice. There is false information out there about the tusks being used to dig for food at the sandy bottom of the water. 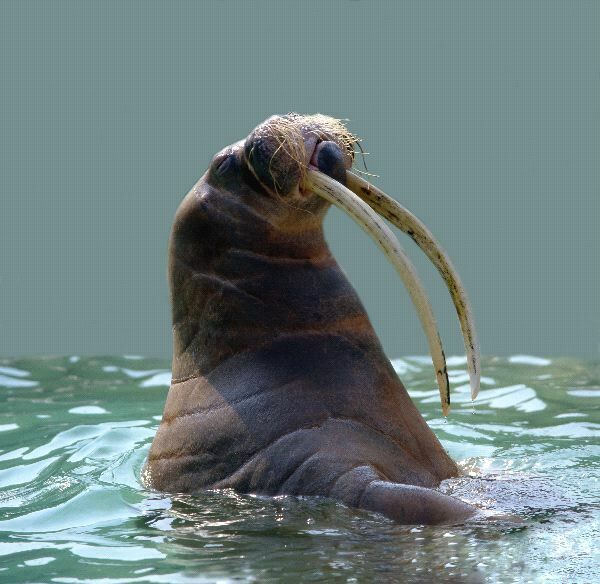 The walrus will rely on their flippers to clear the water and to help them find food sources. Even though the walrus doesn’t chew their food, they do have teeth. They can have anywhere from 18 to 38 teeth. Usually, they will have the lower number of them. The wearing down of the teeth that has been identified may be the result of sand particles that rub on them as they are consuming food. 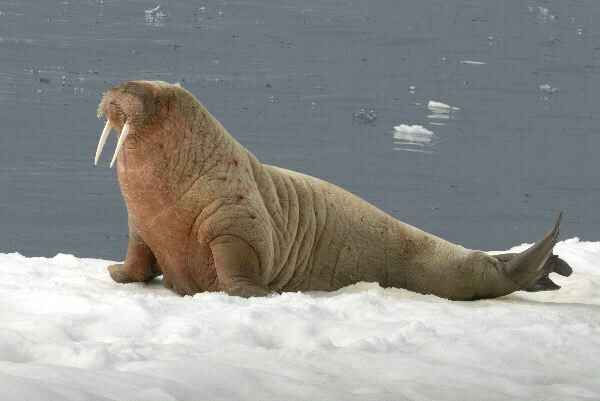 One of the remarkable elements of the walrus is the vibrissae. They don’t have good vision but they use this in its place to help them find food and to identify impending dangers around them. The eyes are very small. These appear on the face of the walrus as whiskers, and there can be from 400 to 700 of them in rows. They can be up to 12 inches long. They are attached to muscles and have both blood and nerves. They are very sensitive and allow them to make out shapes of objects. The rear flippers of the walrus can be moved in a forward motion. They also have a set of fore flippers. When they are moving on land, they will use all of these flippers to help them move. In the water, they have a body that is designed for swimming with ease. The entire body is going to be part of that movement, not just the flippers. You will notice that the walrus doesn’t display external ears. The skin of the walrus can be various shades of brown, gray, and cinnamon. They are brown when they are young and as they get older the coloring will change. Those that are almost pink in color are among the oldest. When they are in the water, they may look white. This is due to the blood vessels constricting with the cold water. They may look bald from a distance, but up close they do have fur that covers it, but it is very fine. The skin as a wrinkled appearance is it is very thick. Under the throat there is an air sac present. This is a type of floatation mechanism. It allows the walrus to float in a vertical direction as they sleep. Many people don’t realize that the walrus has a tail. This is because it is hidden under skin. They also go through an annual molting period where they shed their hair. The males will go through this between June and August. For the females, it can take several months longer. They process is gradual though and as old hairs fall out, new ones emerge in their place. The young calves take part in molting before they are born, called lanugo. This occurs 2 or 3 months before birth. The young calves will also molt again in 1 or 2 months. The hair is thicker for the younger walrus, and as they get older and larger it becomes more dense.